This is the most dynamic wristwatch that shows the beauty of "time rhythm" quartz wearers are unable to experience. Are you wearing a quartz watch? Why not try this one? More photo illustration can be viewed by clicking on “Image Gallery” button above “Email a friend” button. The time sub-dial is uplifted very high, as if suspended in the air. This time-telling sub-dial is black. Small hour and minute hands are silver, with stylish circle at the end. Roman numeral hour markers. Below 12 o'clock is Diamond logo and fine print 1939. The mechanical part of dial is in steel gray color producing great texture. The most eye-catching element is the two flying wheels underneath the time sub-dial, where golden escapement wheel, balance wheel and spring are clearly visible. The crown is signed with a big diamond logo. Golden stainless steel case, of which the exterior sideline is decorated with coin pattern. Behind fine-polished Shanghai automatic movement is a black self-winding rotor, engraved with a golden diamond logo and 1939. Brown genuine leather strap with pin buckle. Light brown stitches are added to enhance the appearance. The design of this double flying-wheels is inspired by Breguet antique watches. The upper part of front dial is characterized by a time-telling sub-dial. The hour markers are Roman numeral. Silver hour and minute hands have stylish circles at the end. The lower part of front dial is completely skeleton layout. Unlike the vast majority where escapement system is found at the back, it is interesting to see the escapement system is mounted at the front - right on the dial. 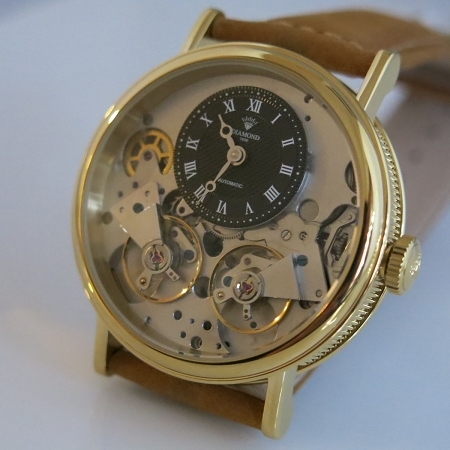 Thanks to this unique design, this watch displays the charm of mechanical system in an unprecedented manner. “Diamond” is China’s oldest watch brand since 1939. It is the 1st Chinese watch brand to be collected and studies by Swiss watchmakers. Eighty years have passed. Diamond watch has won numerous awards and titles including quality products certificates by Ministry of Light Industry, Shanghai quality products, famous trademark certificate, championship in national watch quality evaluation. Diamond watch always adheres to the "diamond quality" philosophy. In the new millennium, Diamond watch will innovate and integrate the latest fashionable elements into product design, so as to meet the demand of consumers both domestic and international.